Bamboo has always been able to lend a helping hand with clothing our bodies, furnishing our homes, and even filling our stomachs. Yet, who knew it could also help release our tension and ease our aching muscles? Bamboo massage is a technique that utilizes pieces of bamboo of varying lengths and diameters in deep tissue body work. Some practitioners incorporate elements of shiatsu, aryuveda, and traditional Chinese medicine. Bamboo has also been used to help drain the lymphatic system in some Thai disciplines. Some choose to heat the sticks and apply essential oils during the session. Bamboo helps to improve circulation as well as reduce the strain on the hands of the therapist. Unlike stone massage, bamboo is easy to clean and does not need a crock pot of water or additional equipment to maintain. Being strong, flexible, and sustainable, the grass is an excellent tool for massage. There are those who believe that the silica surrounding the cell walls of the plant also help to restore the body’s electromagnetic balance, similar to the effect of quartz crystals on connective tissue. The electric potential created by the mechanical application of the bamboo to muscles may help restore the health of abnormal fibers and bone. Heating the sticks also produces an electrical charge, allowing ions to polarize the material, further amplifying the its healing potential. 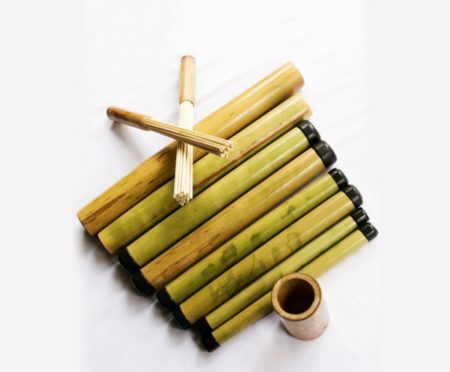 The pressure provided by the pieces of bamboo and hands of the therapist help to release toxins, relieve excess heat surrounding areas of the body, and helping poor circulation of blood and fluids. Acupressure techniques are often used in conjunction with the massage. One of the first to fuse bamboo and massage in the United States was Nathalie Cecilia, a French Thai massage therapist living in Florida. She began using bamboo after a larger male client requested more pressure for shoulder work. Having previously used a long bamboo pole to help with her balance for Thai massage, she decided to use the tool for his sessions. After a positive response, she began to develop what is now known as Bamboo-Fusion massage, an entire massage routine that uses bamboo and rattan pieces of different sizes. The series is now approved by the NCBTMB and has been taught to many practitioners across the country and overseas. Bambu Batu would love to hear from those who have had a bamboo massage! What was your experience like? How does it compare to traditional deep tissue work? Who are your favorite practitioners on the Central Coast?